I just received the phone I ordered from AT&T Office@Hand. How do I set it up? Office@Hand provides reliable, high-quality voice service. Your local network, your internet connection, and your router devices all contribute to overall call quality. Phones ordered from Office@Hand are pre-configured, fully provisioned, and ready for calls. Just plug phones into a high-speed internet connection to get started. Step 1. Test your internet connection bandwidth. This test will help you determine the maximum number of simultaneous Office@Hand VoIP calls that can be supported on your broadband connection. This test will simulate VoIP calls between your computer and Office@Hand and will provide an estimate of the voice quality you should expect when using our service. Step 2. Configure your modem. Verify that your modem is in IP pass-through or bridge mode. Note: Contact your service provider for instructions. Step 3. Buy/configure your router. 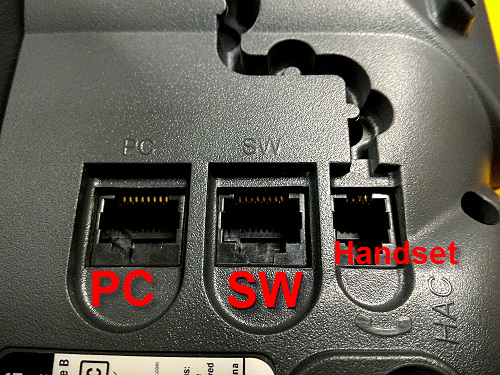 Configure according to the instructions found in the Router Configuration Guide. Note: You may need to purchase a new router. Step 4. Plug in your phones. For best voice performance, plug your phones directly into the network, then plug your computer network cables into the back of the phone. To know where to plug the cables at the back of your Office@Hand phone, go to Setting up your Office@Hand phone. In order to have your phone system run successfully, it is essential to have your network set up correctly. Attach your handset to your phone base using the coiled cord provided, if applicable. Click on the links below for the image. 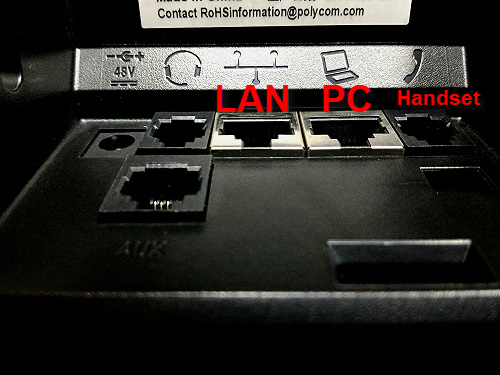 If you are not using PoE (power over Ethernet), connect your phone to the A/C adapter device. Plug the Ethernet cable into the WAN port on your phone. Plug the other end of the Ethernet cable into your router or internet jack in the wall. Once your Office@Hand phone detects an internet connection, it will automatically download and run the provisioning configuration. IMPORTANT: You phone will restart several times while provisioning. DO NOT manually turn off your phone during this process. How do I tell if my phone is Online? • When your phone is provisioned and online, it should display the Date and Time set on the extension where the phone is assigned to. Go to Admin Portal, and then click Phone System. Click Phones & Devices. Under Phones & Devices, you should see the Serial Number of the device that was provisioned. If the device is showing the Serial Number, it means that the device has been registered and provisioned with Office@Hand. When you click on the device, you should see the Phone Details section. The Phone Nickname should appear on your phone’s screen, and the Status should show Online. 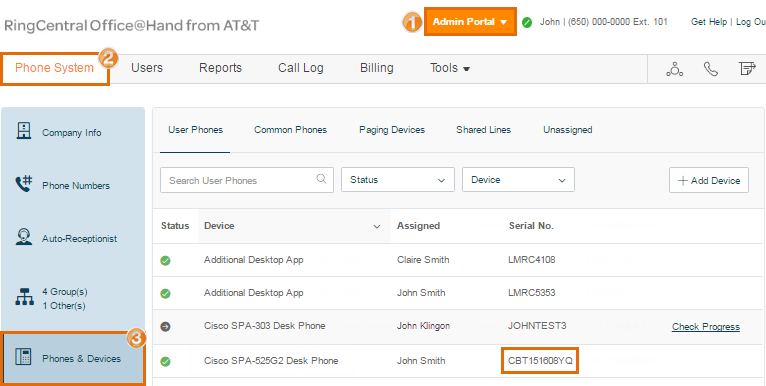 Note: If the Phone Details show Order in progress: Check Status, and the phone is Online, you just need to restart the phone 3 times to allow the server to refresh and register the Serial Number associated with your device. If your phone is still Offline after doing the above steps, please Contact Office@Hand Support.